It is Bloomsday once again, celebrating the day Ulysses is set: 16 June 1904. 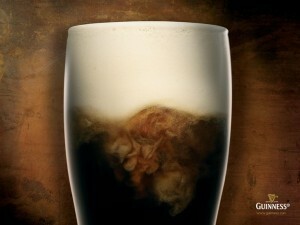 And in honour of the day I thought I’d share my recent experience of the Guinness ‘Surge’. It’s a method of supposedly giving a perfect pub Guinness by opening a can and sending soundwaves through the poured drink to make the flat matt go creamy. It’s fun to see, okay to drink, and totally pointless. Wot would the Citizen say?